Some people associate Ellis Island with immigrants viewing the Statue of Liberty on their way to debarkation. The words at the statue’s base read, "Give me your tired, your poor, your huddled masses yearning to breathe free, the wretched refuse of your teeming shore. Send these, the homeless, tempest-tossed to me, I lift my lamp beside the golden door!" On America’s western shore, however, there was no statue to greet new arrivals when they disembarked on Angel Island. Because immigration laws can change, and because they can do so while passengers are still at sea, some Chinese immigrants spent months waiting on Angel Island while their cases were being decided. Some, after their long waits, were forced to return home. Some Chinese immigrants passed the time writing poetry upon the walls of their prison. Although many of the poems the men’s poems were preserved, the woman’s barracks burned down and none of the women’s poems remain. Colorado author, Teow Lim Goh, has re-imagined their poetry in her book, Islanders. Her poetry is stark, inciteful, and very sad. 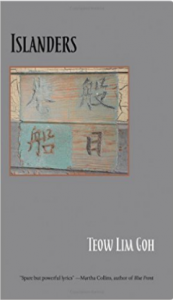 Her notes at the volume’s end provide a short history of Chinese immigration to the United States. Recommended.